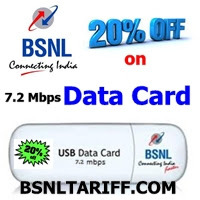 Most Trusted Telecom Brand in India Bharat Sanchar Nigam Limited (BSNL) has announced to reduce the Sale price of Data Cards under 3G Services. The BSNL Competent Authority of Tamilnadu Telecom Circle has slashed sale price of 3.6Mbps and 7.2Mbps 3G USB Dongle type HSDPA Data cards for limited period of time under promotional basis for 28 days. The above slashed rates will be implemented and with effect from 01-07-2013 to 28-07-2013.